Did you read it? Anyone? I've heard good things. 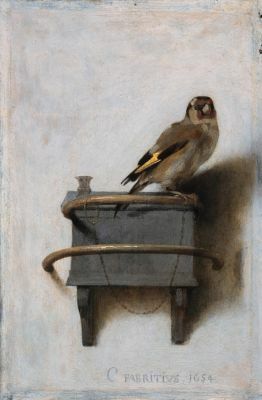 Because the book is for an important part based around a painting by Dutch painter Carel Fabritius ('The Goldfinch'), the book had its premiere in the Netherlands, today. I assumed the English version was available before, but I see now that in other countries it won't be out until later. My copy arrived today! Very excited but I've got a library book to get through first, dammit! I started this Friday evening too, and have just cruised through the first 80 or so pages without really trying; it's very promising so far. I'm probably one of the few who enjoyed The Little Friend, I like the Southern gothic of it, but it's not a patch on The Secret History of course. Pleasingly then, as Hayley has already pointed out, this is much more akin to The Secret History in terms of just wanting to keep reading it, and it's narrative voice is closer too. So far so very good. We'll see in another 700 pages time if it can maintain it. I thought this was a very enjoyable read. Some parts seemed a bit long without much happening, but in the end almost every detail came back in some way or another. Not very uplifting, but good. am I the only one who was really disappointed by it ? Not a patch on "the secret history"
I really enjoyed it. Not as good as TSH but better than Little Friend I reckon. To be honest, I don't think any book will grip me as well as TSH did, but I really loved the characters and the story. I thought it was incredible. Different to The Secret History in lots of ways but similar in some and, I thought, equally good. I read about half of it slowly before the holidays and then totally immersed myself in it for several days and basically lived in it for that period. I found it pretty emotional in a lot of parts because I think she did an incredible job of weaving that sense of loss and yearning throughout Theo's life, and that sense of his depression and drug use just seeping into and pervading everything in the later parts of the book was really affecting to me. The parts in Amsterdam just filled me with utter dread the entire way through and a sort of feeling of loss and… I don't know how to describe it, it's almost like she prompted me to think out this alternate history of his life, through the descriptions of his mother that were scattered throughout the book, like a constant reminder of his loss and what could have been, and with every turn his life took later in the book it felt doubly awful because of that contrast. I thought the plot was really intriguing and I was definitely interested in it, but at the end of the day, it wasn't really about the plot, was it? One of the things that Donna Tartt excels at, both in this and the Secret History, is capturing that feeling of displacement and being cast adrift in a world that isn't quite yours. I'm looking forward to reading this again. You're all way too hard on The Little Friend in my opinion. Think I've said this before but that was the first one of hers I read so I suppose that may have helped! Anyway, I'm reading The Goldfinch right now and thoroughly enjoying it. I had been attempting to read Telegraph Avenue by Michael Chabon but after spending about a month getting nowhere past 100 pages I'm very glad to say I gave up! There's always a part of me that thinks such a large, highly respected book should involve an element of work to read, but The Goldfinch is just such an absolute pleasure! Really looking forward to having a week off after today and being able to spend even more time with it! islandhopper wrote: There's always a part of me that thinks such a large, highly respected book should involve an element of work to read, but The Goldfinch is just such an absolute pleasure! Yeah, absolutely, it feels like a real work of art, but hugely readable and accessible. Just finished this today and I think it's the best book I've read all year. In contrast to RITH, I'd say that, despite all the misery that comes before, the end is pretty uplifting in it's way, though I guess it depends on your expectations, I reckon that any light in the darkness is a bit of a result. I liked this even better than 'The Secret History'. Yeah, I said that and I'm not sorry.